There are three types of screensaver that can be used within Kiosk Browser. The screensaver function is activated when the device has been idle for a specified amount of time (default is 5 minutes). To enable, go to Settings > Display > tick Screensaver. To change the timeout from the default tap "Screensaver Timeout" and select the timeout you require. 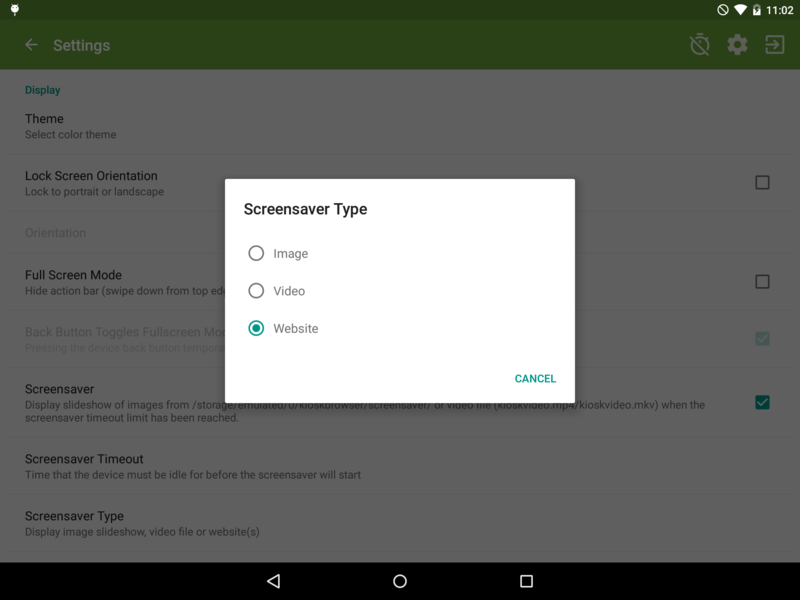 To select the screensaver type tap Screensaver Type. This plays a slideshow of images (JPG/PNG) stored in the screensaver folder. By default the image will change every 45 seconds. To change the default just tap Slide Delay and select the value you require. By default images will display in the order they are stored on the filesystem i.e. 1.jpg, 2.jpg, 3.jpg etc... If you wish to randomise order images are displayed use the setting Randomise Screensaver Images. You will need to use a file manager/explorer in order to place images in the relevant directory. This plays one video file on loop, it supports either MKV or MP4 formats. Place a file named kioskvideo.mp4 or kioskvideo.mkv in the screensaver folder. If your video file isn&apos;t looping please see this troubleshooting article.